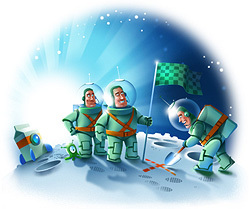 Strictly speaking, Basecamp should not be regarded as a project management tool. Even its developers agree to this. “Basecamp is the leading web-based project collaboration tool”—says the official site of this highly respected program in large font. Basecamp is a communication tool. It is alternative to emails. Basecamp will not be able to measure the work load for the whole team nor for each member individually. Basecamp is also unable to evaluate the realism of set deadlines. Instead, it simply helps us at exchanging the required information inside a team and with our clients. Turbomilk: Custom icon design for websites, mobile and desktop applications. We at Turbomilk decided to join the hordes of banner advertisers considering banners to be the most classical and fair way of advertising. We ended up choosing Fusion Ads banner network for our campaign. No flash, no animation, just a static picture. Madness?! You could say that. But what a campaign! Now Iconza’s icons are available in Iconfinder, the icon search engine. But they are not merely lying around there. You can recolor them right on the search engine results page. Originally the Iconza’s icons are depicted in Gothic black and a special switch serves for selecting the right color. We also would like to use the opportunity to give our best to the creator of Iconfinder Martin Leblanc. We decided upon making a web application that would serve a collection of customizable icons. Any project needs a cool name and a logo. We started off with naming. We have launched a new Turboproject called Iconza with a whiskered carrot for a logo. In essence it is a set of royalty-free icons but it is not as simple as it looks. You can recolor and resize the icons right on your screen! 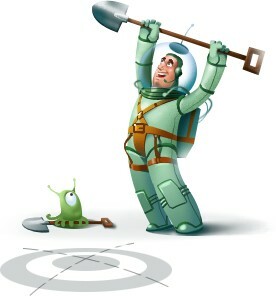 All new stuff is extremely lucrative: it lures a feeling of novelty and freshness. I sincerely believe that a newer version is always better than the previous one. But there is one software package that undermines my life views. I am talking about Adobe Illustrator. It gained so many useless functions that operational mistakes have become too easy to see. It all lasted for six passed years. Here is an appropriate time for a short sermon. We love music very much. We even have a dedicated music server. Tastes differ however and we failed several times creating a one-type-suits-all music background in our office. Online radio Seven Skies reconciled this problem and we keep tuning in to this wave for three consecutive weeks non-stop. And how does your office sound like? A delegation of three brave Turbomilkers will descend at ReMIX’09 web conference to be held in Moscow on April 20, 2009. And we will not only be engaged in hearing the reports. Denis Kortunov will give his answers to the questions of participants of the “Interactive web” worshop at 5:00 pm. By the way, Turbomilk acts as an information partner of ReMIX. Back in 2004 Arseniy from Designcollector asked for a favicon for their project. Since then we are connected by not just hyperlinks but also by warm friendly relations. This year Designcollector celebrates its sixth anniversary. The guys have setup a little contest with some invited guests. We have also participated in it! I finally reached Las Vegas and now joined the MIX 09 conference, which has just begun. Expect a number of reports on design and interfaces (lots of designers among participants). The conference features the online video broadcasting from the event. I will be taking pictures and Turboflikring it as it progresses. 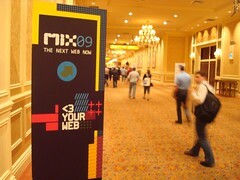 So it happens that I will visit MIX 09, the conference that will be held in March 18–20 in Las Vegas. As a rule, the designers get bored at the events organized by Microsoft due to the high level of technicality. But this time we are promised quite the opposite — a lot of reports on the subject of design, social networks and the future of the Web. The delegation from Turbomilk had tons of fun at ReMIX last year. Therefore, it was out pleasure (and honor) to make a modest contribution into setting up ReMIX’09: we have drawn remix.ru, which is not really a site but a stub in Windows 7 logon screen style. journal New Apple’s Safari is catching up! We very much like Google Chrome. Apparently Safari was originally meant to be like Chrome from the interface perspective. As it happened recently, Apple released a new version of its browser resembling Chrome in may interface solutions. Now we are wondering, whether Google has finally became the lawmaker in GUI and Apple was made a sad runner-up? Judging by the many online reviews, the brave souls who have downloaded and installed the beta version of Windows 7 are, in general, pleasantly surprised. Your humble servant likewise entered into the ranks of the brave souls. I confirm: it’s actually pleasant to work with No. 7. However, given the many new and different functionalities, and well-written reviews of other authors, allow me to throw in my two cents worth in our particular area of expertise: visual interface design. We have decided to significantly improve our web sites’s usability (by 37%) to become even more visitor-oriented (by 59%). For this reason our new designer Evgeniya has come up with a set of rocking illustrations for About Us picturing the hardships of our working days. The verisimilitude of the pictures tops all possible heights. The pictures were drawn on location. Now everyone is clear about what Turbomilk is really up to! Every single designer is dreaming about being involved in creating the original icon set for an operating system. It is far more exciting if the set will be used in a massively distributed system such as Windows. We have uncovered some interviews with people from Microsoft who made their dreams come true. Here, icon masters from Microsoft address 10 most frequently asked questions on design.